After a number of attempts by Congress to interfere with the implementation of the numeric nutrient criteria that EPA recently approved for Florida, the EPA has backed down and has stated its intent to approve the less effective standards being proposed by the State instead. EPA approved the new nutrient standards after the State had failed to adopt any of its own. The targeted pollutants are the nitrogen and phosphorus found in fertilizer, sewage and animal manure that trigger algae outbreaks in Florida’s lakes, rivers and bays. 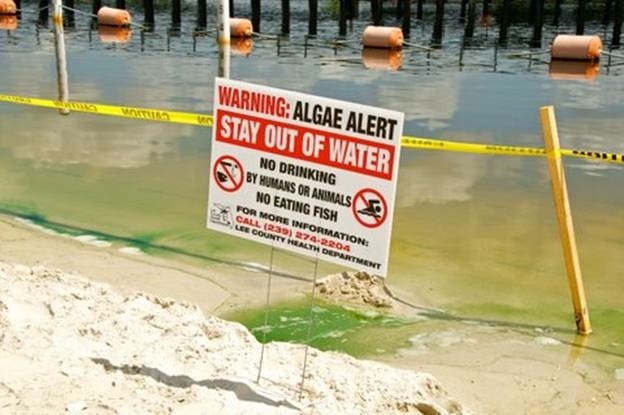 These often severe algal blooms have wreaked havoc on coastal ecosystems, have had major public health impacts and are costing Florida money from recreational and tourist opportunities lost. The Surfrider Foundation has been asking the EPA to take strong action to control the pollution that is responsible for the conditions that allow these algae blooms to thrive, but unfortunately the political pressure from Congress to restrict EPA's ability to enforce their numberic nutrient criteria seems to have won the day. We are disappointed by the EPA's recent decision to accept the inferior State's proposal and to not do its best to protect Florida's coastal waters and public health. Read more in editorial below from the St. Petersburg Times. Sign warning about toxic algae on the Caloosahatchee River, June 2011. Photo by Mike Dove. Why is the federal government continuing to reward Florida for dragging its feet on cleaning up dirty waters? The latest gift to the state's big polluters and their enablers in Tallahassee came this week when the Environmental Protection Agency gave tentative approval to new state pollution standards. The rules are far short of what Florida waterways need — a testament to politics winning out over science. The EPA is backing off a long-running fight at the expense of public health, the environment and tourism. In 1998, the federal government told the states to limit nutrient pollution in lakes, rivers and coastal areas by 2004 or it would do the job for them. But the deadline came and went. Environmental groups sued in 2008 seeking to compel the EPA to intervene under the Clean Water Act. The agency settled the case in 2009 under an agreement that it would draft the standards for Florida. After 11 years of stalling, new rules were on the way and expected this year. But the agency backtracked after industry groups and newly elected Republican leaders made wild and inflammatory charges about what the cleanup would cost. In June, the EPA said it would give the state another chance to write new standards on its own. This week, the agency said in a preliminary review that Florida was headed in the right direction. While the EPA has not formally agreed to sign off on the rules, its tacit approval weakens the agency's leverage in forcing a meaningful cleanup of Florida's waterways. Environmentalists are right that the EPA's concessions need to be seen in their totality. The agency agreed to exempt entire industrial operations from the clean-water rules. It created loopholes for meeting the law, a waiver process for polluters to wiggle out from it, and delayed enforcement. Even this week, the EPA almost apologized to the state for having to intervene as part of complying with a court order. EPA has also signaled to the state that it would be flexible in how it enforces the cleaner standards. Pollution taints 2,000 miles of the state's rivers, 380,000 acres of its lakes and 569 square miles of its coastal areas. Runoff from farms, utilities and sewer plants sparks fish kills, taints the public drinking water supply, damages waterfront property and tourist attractions and causes outbreaks of respiratory illness and other diseases. If state leaders want to talk costs, they should at least be honest enough to acknowledge the damage that polluted water causes to our property, health and tourist economy. This case is not ending with the protections that Floridians deserve. The EPA should quit mollifying the special interest voices in Florida and work instead to protect the public interest.